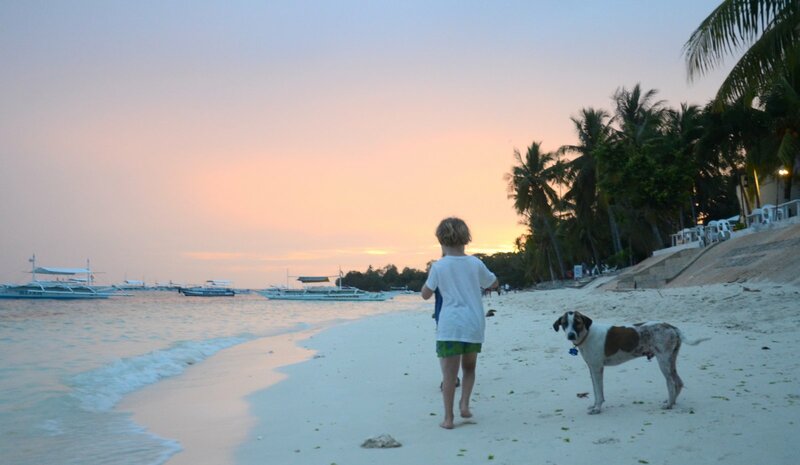 This was OUR FIRST MOM & SON ADVENTURE outside of Europe. 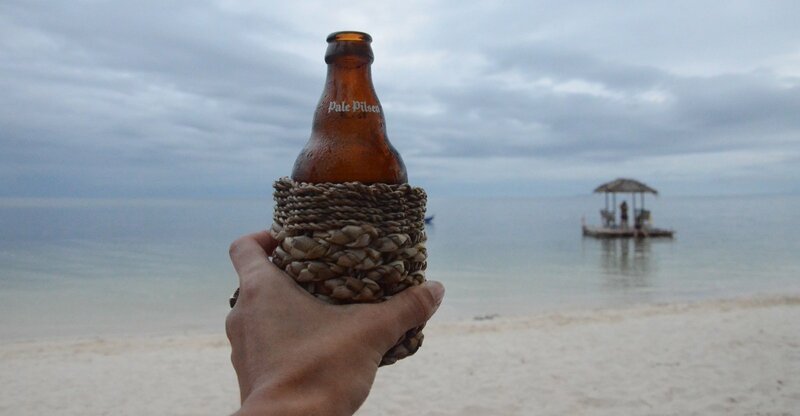 I bet the Philippines are not one of the easiest countries to try this out, but we made it. And we had fun! 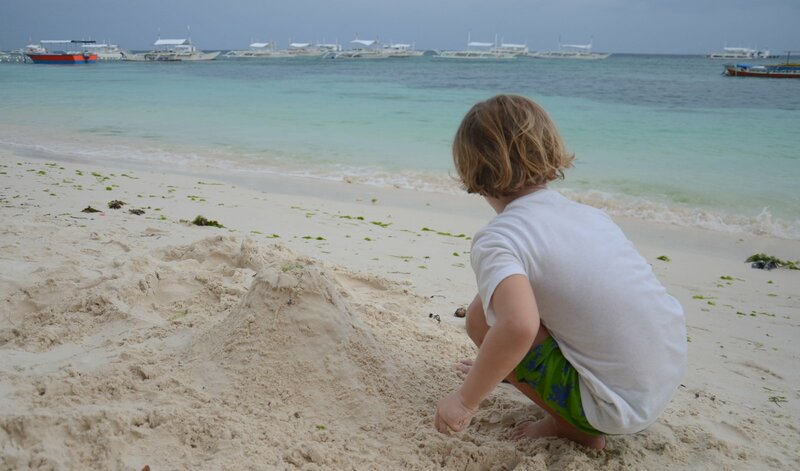 And i realized I was totally able to do this SINGLE PARENT TRAVELLING thing. A friend and her 5-year old son decided to join us, so we went together. It was quite practical at times because Lu had someone his age to play with. Overall it was a nice trip despite the fact we were quite UNLUCKY WITH THE WEATHER in the second week and had to change plans a bit. Read more about what we did and where we went below. 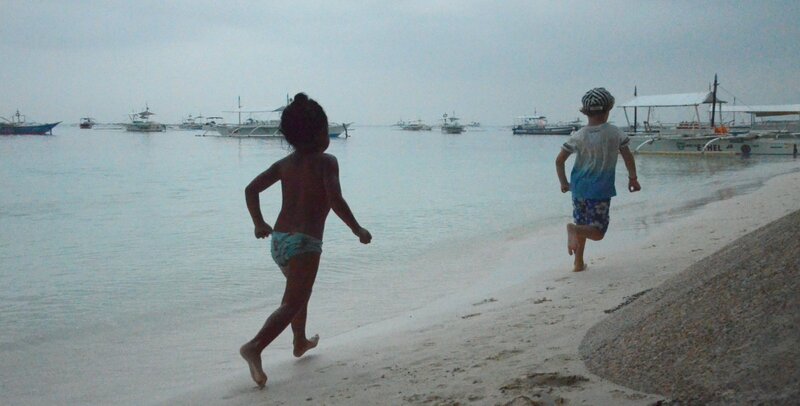 WE VISITED THE PHILIPPINES WHEN LU WAS 5 YEARS OLD. THERE IS A SECTION ABOUT THE PHILIPPINES WITH KIDS AT THE END OF THIS POST. The PHILIPPINES ARE HUGE and there are so many islands, it is impossible to see them all. If you have around 2 weeks time like we did, it is best to narrow it down to one area. Since there were direct flights from HK to Cebu, we stayed in this area and missed out on PALAWAN, because this would require another flight via Manilla. 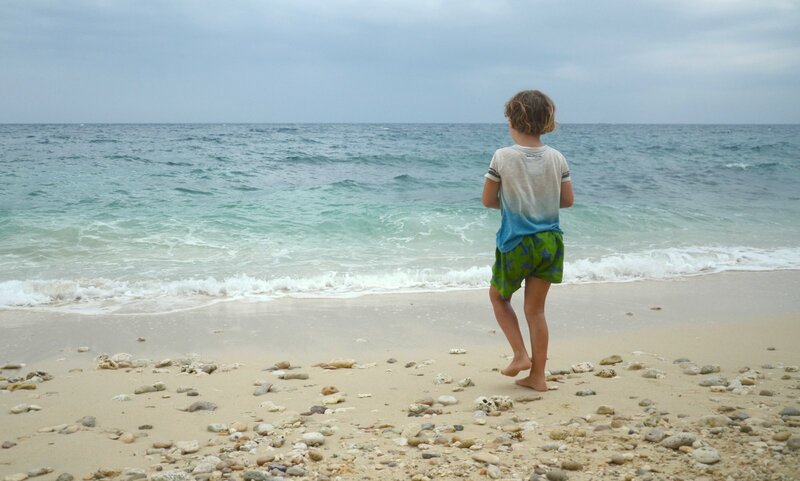 Initially we intended to visit the ISLAND APO to swim with the turtles as well, but had to take a pass due to the rough sea. We flew in to Cebu from Hong Kong with Cebu Pacific and immediately transferred to the port where we caught a ferry to Bohol. We used FERRIES between the islands although sometimes you can also FLY. Negotiate a price before taking a TAXI or the JEEPNEY or the TRICYCLE and have in mind that the traffic in bigger cities can get really heavy so it might take a while before you reach your goal. We took the BUS two times and it was really comfortable. You can of course rent a MOTORBIKE as well. I strongly advise you to check the ferry schedule directly at the port or have your hotel call them and double check – we took a look online, but it was not updated and made us miss an important ferry once due to which we had to change our plans. The FERRIES are kind of okay though, we had rough sees but they got us from A to B. Although SAFETY must be an issue, at least we did not always have life jackets aboard. I did have swim helpers with for Lu just for this reason, even though he can swim without them otherwise. We took a PUMP BOAT a couple of times, that was ok as well, but again, when the sea is rough, you will get wet and it will be a bumpy ride. We booked a few hotels in advance, some we just found on spot. 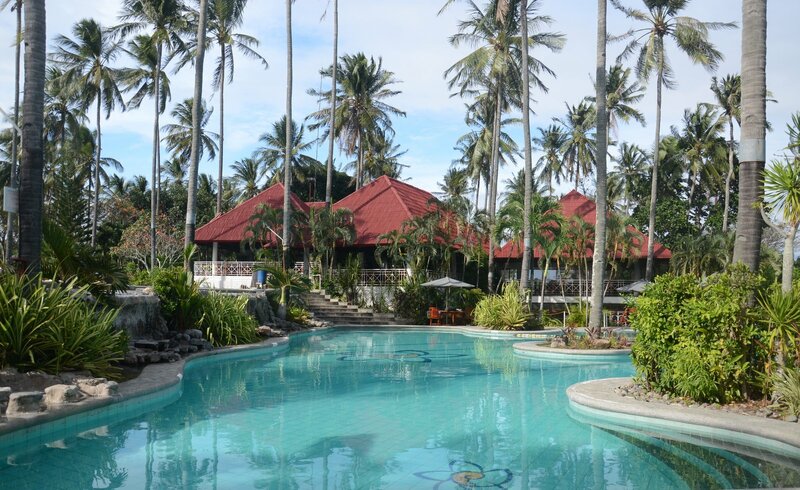 Because we were travelling with my friend and her son we just took family rooms most of the time and had pools in every hotel except in Panglao. 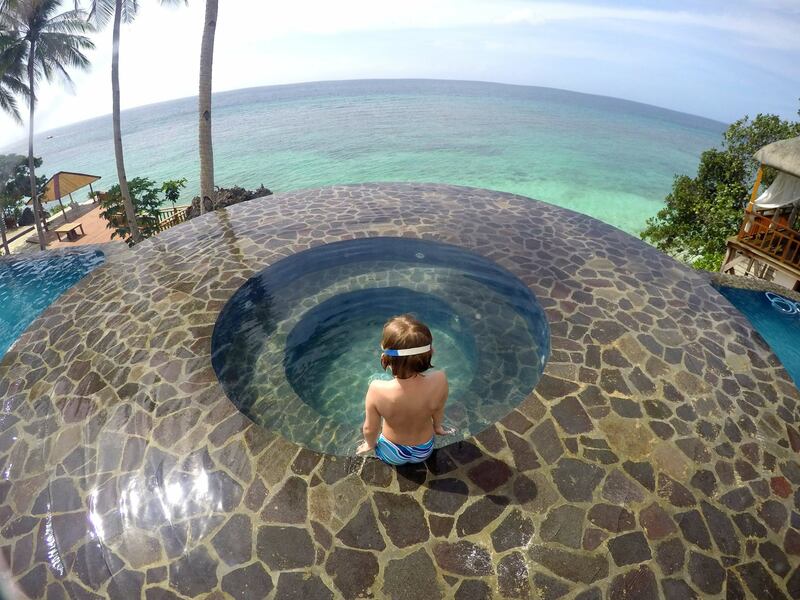 If you are travelling with kids a SWIMMING POOL can really be a life saver. 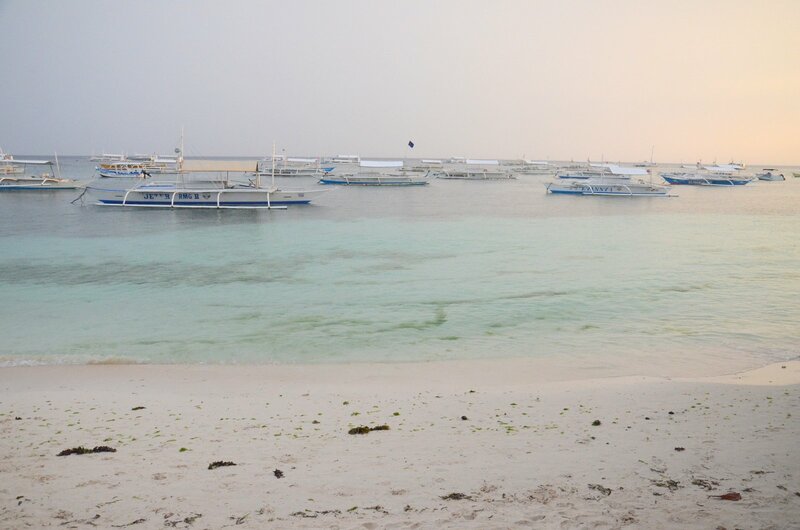 PANGLAO (Bohol) is also the one place I would really say it is wise to BOOK IN ADVANCE because everything seemed to be full and it was by far the most touristy place we´ve been to on this trip. BREAKFAST is normally included in the price and usually there is a RESTAURANT in the hotel so you can have a snack and a dinner if you don´t feel like going out. Before we left I´ve heard many negative critiques about the Philippines cuisine, saying it´s too sweet, oily and fat. So my expectations were kept low, but in the end I found the food to be tasty! 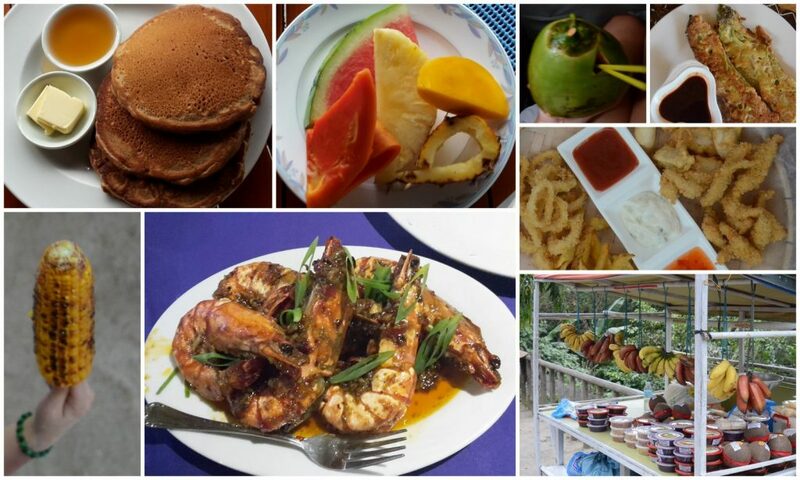 Our favourite street food choices were FRUITS, COCONUT and GRILLED CORN, PANCAKES & fruits or OMELETTES for breakfast and yummy spicy SEAFOOD for lunch or dinner. It was possible to get WESTERN FOOD almost everywhere in case you have picky little travellers with you. The TRANSFER TO BOHOL FROM CEBU AIRPORT is not too complicated. You get a taxi first, buy the ferry ticket and enjoy a couple of hrs boat ride. No need to pay extra for the AC, we sat upstairs and the wind did the work. 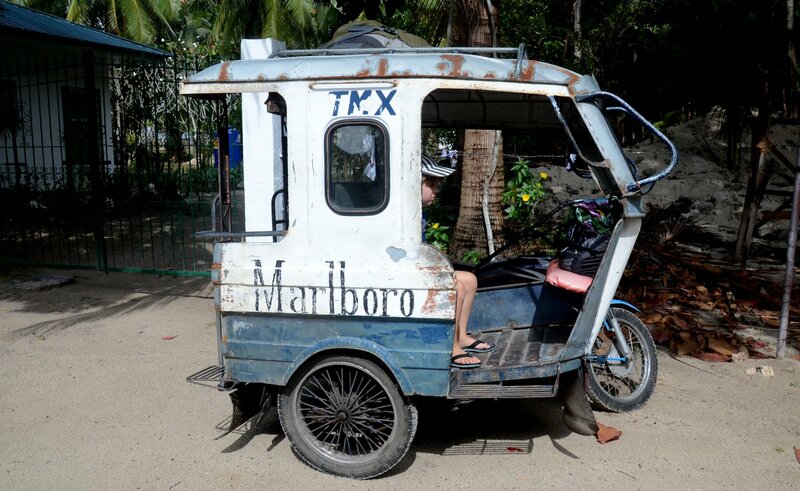 After landing in TAGBILARAN we took a taxi to our hotel in ANDA on the eastern side of the island. 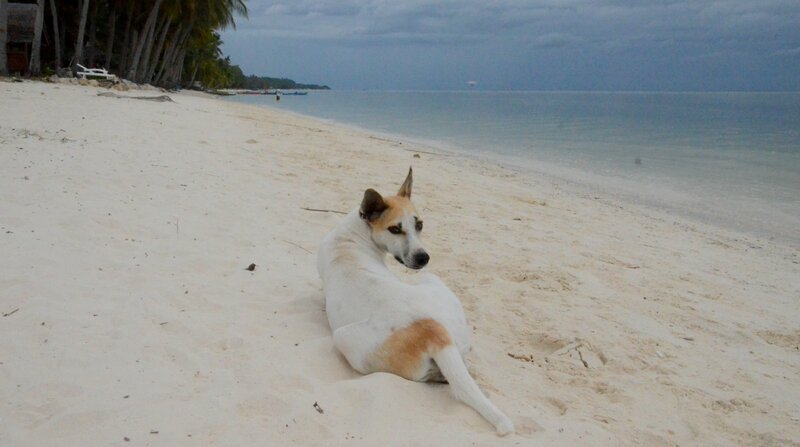 Anda is much more RELAXED than Panglao and this is exactly why we chose to spent the first 3 nights here and just do practically nothing but swim, eat and sleep. 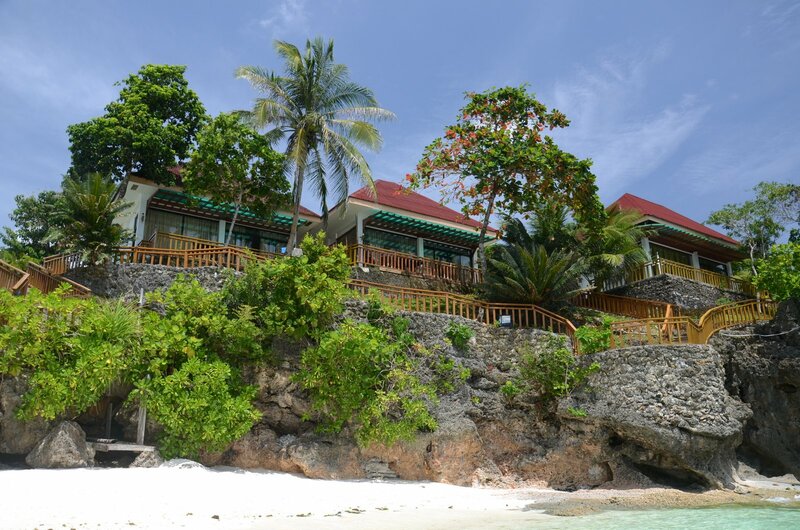 We stayed at a wonderful BEACH BUNGALOW above the sea, just a few steps form the beach, had 2 pools and a lovely restaurant with the most friendly hotel staff, yummy seafood and cold beer, I took a massage once – what more can you ask for? We were considering taking a trip to the CAVES nearby, but I guess we were really too lazy to do that and after spending 4 really active days in Hong Kong, we kind of needed to just enjoy the sun and the sea. 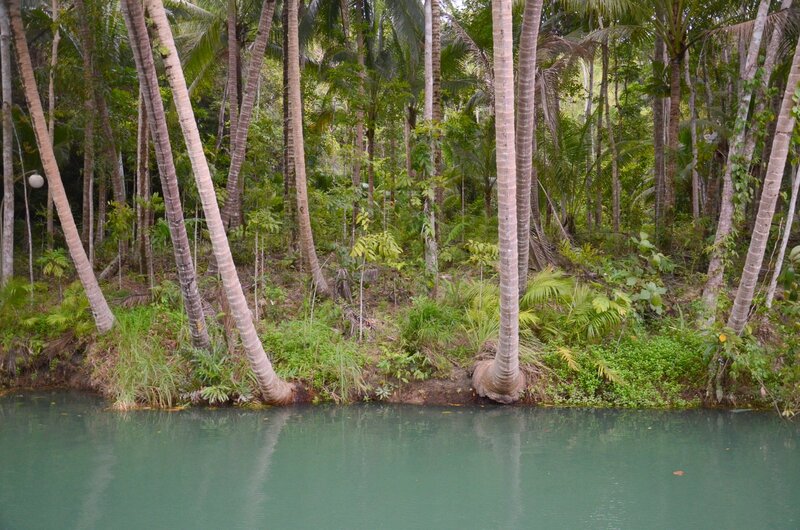 We organised a DAY TRIP TO THE CHOCOLATE HILLS, TARSIER SANCTUARY & LOBOC RIVER on the day we checked out of the hotel – the driver left us in PANGLAO at the end of the day which was really practical – we had to make the drive anyway. I believe every single tourist that comes to Bohol does this day trip, so here we go. 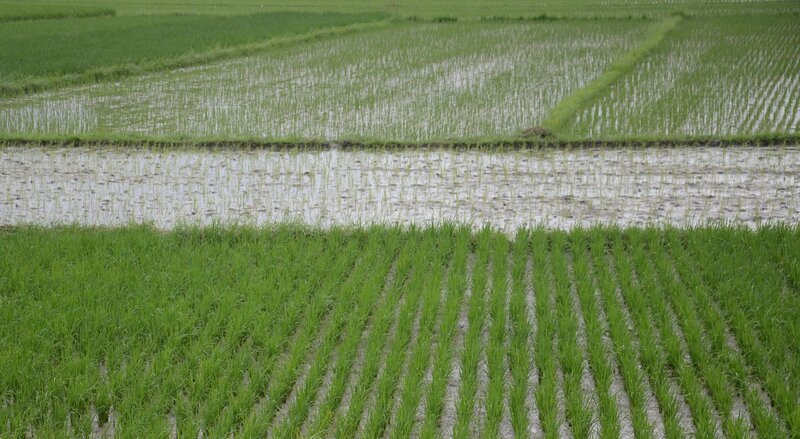 Just a few kilometres outside of Anda we saw beautiful RICE FIELDS, PINEAPLE FIELDS and lush FORESTS and made our first longer stop at the famous CHOCOLATE HILLS. Let me tell you, when I first saw photos of these hills a couple of years ago on a blog I love to read I thought one must take like a serious hike to get to this view. And I kept seeing photos elsewhere, thinking the same. Until we parked the car and joined the other 300 tourists who climbed up the steps to the VIEWING PLATFORM. Never mind, the views are still incredible and the hills are something like I´ve never seen before, so it´s still worth seeing it. 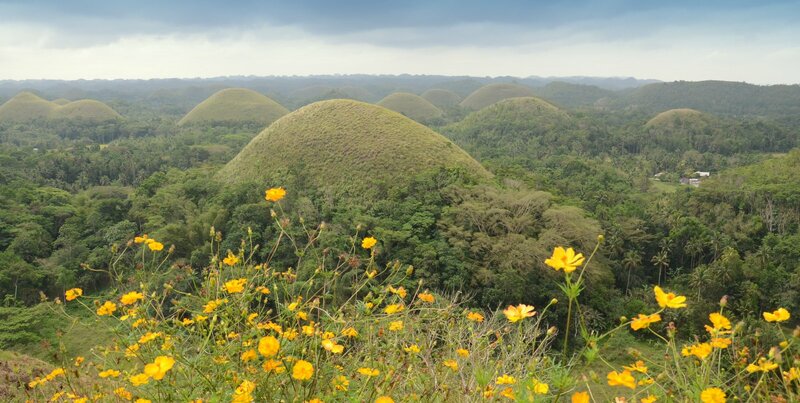 There are OVER 1000 HILLS in an area of more than 50 km², covered in GREEN GRASS THAT TURNS BROWN during the dry season – this is where the name “chocolate hills” comes from. At the foot of the hills you can take a ride on a QUAD BIKE – you are not allowed to go all alone, so you will be assigned a guide after which you have to drive and quite honestly the path you take isn´t all that spectacular but if you´ve never driven those it´s a fun thing to do. We basically did it just because we knew the boys will love it and it was just as predicted – they didn´t want to step off at the end. 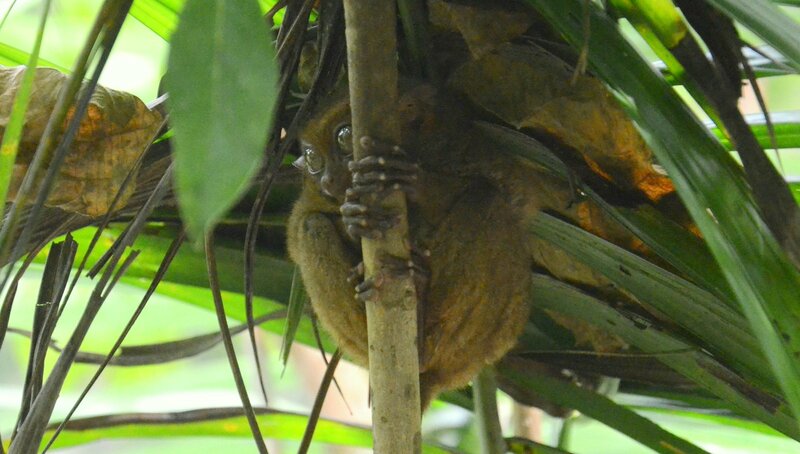 Our next stop was this FORESTED AREA, home to a conservation centre of one of the WORLD´S SMALLEST PRIMATES, the TARSIER, with their body smaller than a human palm. These cute little animals are nocturne, so you really need to be quiet while walking around, making sure not to disturb them as they might be mostly asleep. If you´re lucky one of them will be kind of half awake and you can spot his big eyes. Just a few minutes later we stopped at this hanging bridge and were obviously not the only ones. There was quite a queue to cross it and come back on the other one. You could buy snacks and souvenirs on the other side. 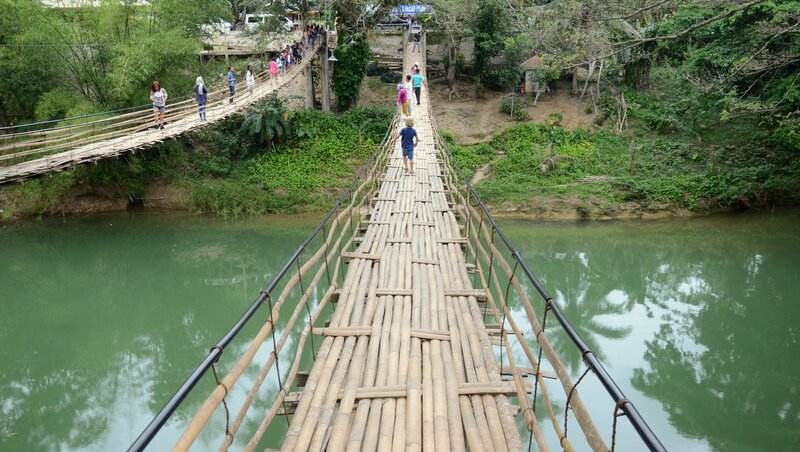 Again, it was fun for the kids and fine if you never saw a hanging bridge before. As usually on day trips, there was LUNCH INCLUDED in the price and here, everybody has lunch on a BOAT, cruising the LOBOC RIVER. I am quite indecisive about this one, did I like it or not? On the one hand side the nature and river banks were beautiful, but on the other hand – it did seem like one of those typical things orientated towards mass tourism – there was really loud LIVE MUSIC played the whole time of the journey. At one point the boat made a short stop and everyone leaned over to film/photograph a DANCE PERFORMANCE of local villagers (I bet they did it like 100 times a day) for a few minutes, the FOOD BUFFET was okay but really nothing special and if you sat facing the “wrong” direction you almost had to break your neck to see something of that beautiful nature, otherwise you were stuck with starring at the musicians. I usually don´t complain, but this was just not my thing ;). Despite that I have to point out that the whole thing is very well organised and everyone was friendly as always. Anyhow our stomachs were full and all that was left is to find our hotel in Panglao. Back at the sea we dropped our bags in the hotel and HIT THE BEACH! 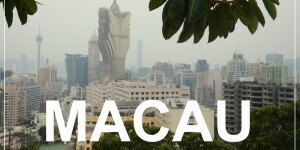 We stayed here 2 days and enjoyed the LIVELY ATMOSPHERE – it was much different to Anda, this place reminded me of Thailand actually, because there were so many hotels, guesthouses and bars & restaurants. The beach was nice and perfect to grab a COLD BEER and a grilled corn and watch the SUNSET while the kids played. We had the first RAIN DROPS but luckily found a tree to hide under. I THINK THE PHOTOS SPEAK FOR THEMSELVES. 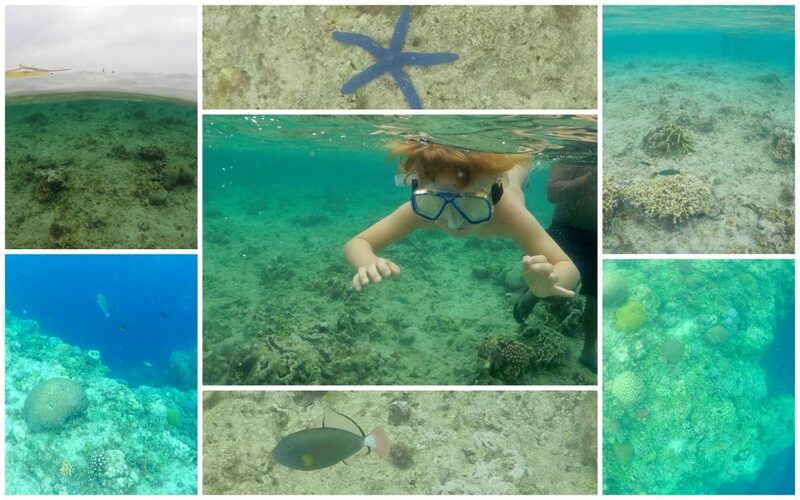 One day we took a trip to one of the small islands close to Panglao to check out the UNDERWATER WORLD. 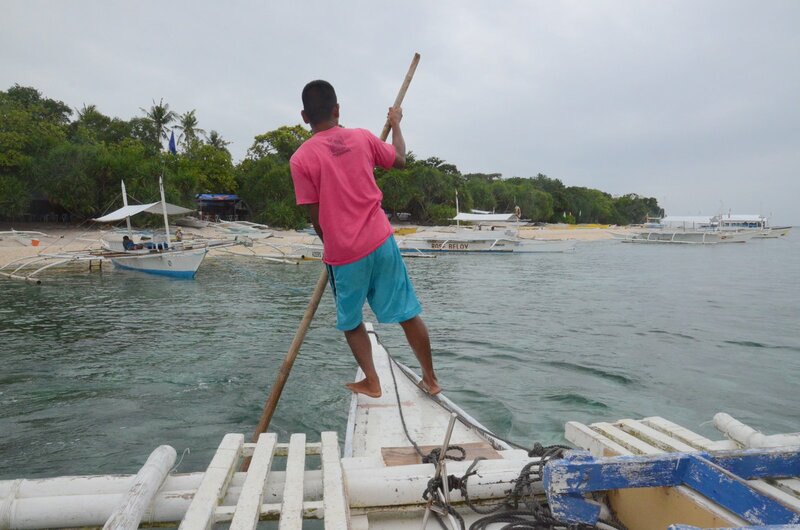 Most of the PUMP BOATS leave Panglao early in the morning, but we first had an lazy breakfast and negotiated a good price with a local fisherman on the beach afterwards. The ride was LONG, SLOW, SMELLY and really LOUD! We had problems with the motor and the two men steering the boat had to use the buckets to throw the water coming into our boat back out. The seemed very calm at it so we assumed it happens all the time. Got there safely and back as well. Do not expect to find a nice beach here. 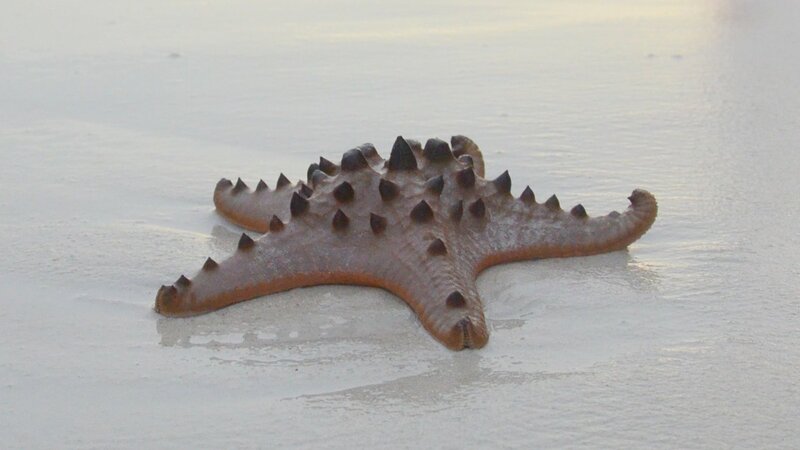 Basically it´s all about SNORKELLING but even this you must rent another smaller boat which takes you just some ten metres of the coast to a designated are where you can snorkel. 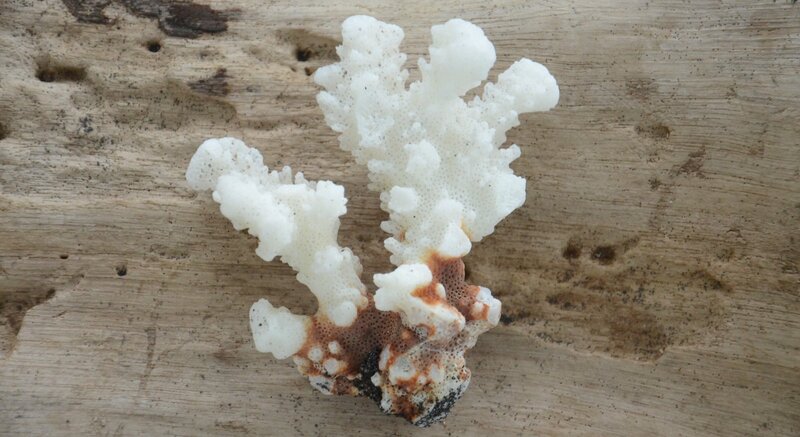 I must say I´ve seen nicer CORALS and FISH, but it wasn´t bad at all and Lu absolutely loved it. On the way back we were caught up in a powerful storm, but luckily that was already towards the end of the journey. The forecast for the following days wasn´t looking too good and I think this was the point where we started to question how the rest of our trip will look like. 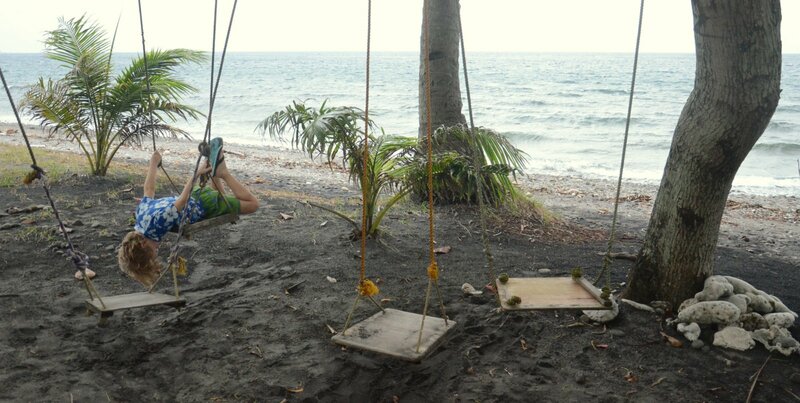 On the day we intended to leave Bohol and take a ferry to Negros things got complicated. It turned out that just a week ago they CHANGED THE FERRY SCEDULES, but did not update this information online. Our hotel reception in Panglao was not informed either. So here we were at the TAGBILARAN PORT at 9:20 am eager to buy the 11am ticket only to find out the ferry had already left. The next one is at 5pm! 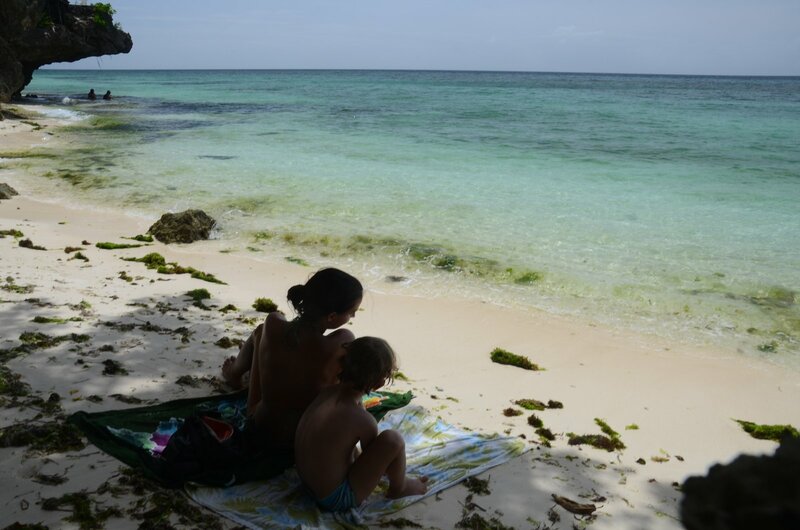 That were too many hours to spent in a port with 2 kids so we decided on PLAN B which was to go to SIQUIJOR ISLAND. The ferry was leaving in an hour. As soon as we reached it, we noticed it has quite a different feel to it. 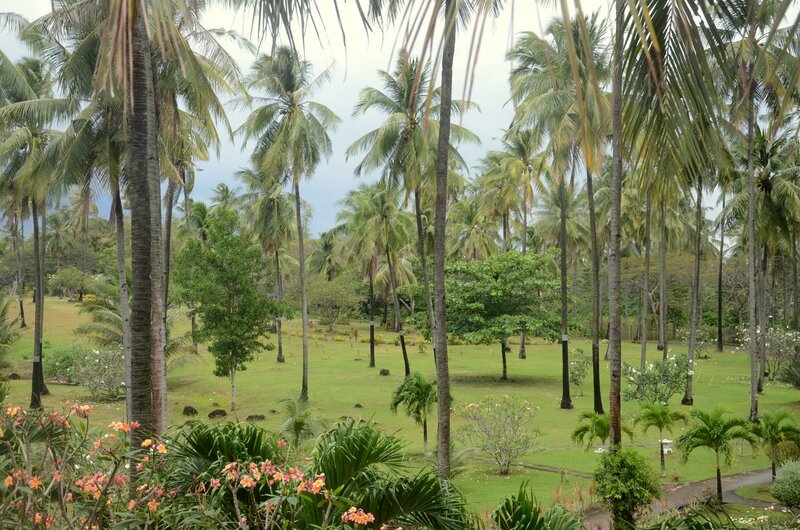 Everything looked somehow more tropical and LESS DEVELOPED. The ferry was much smaller as the one from Cebu to Bohol. Upon landing we checked the ferry schedules for the next day and found a place to sleep. It was RAINING CATS AND DOGS but the rain stopped in the early evening. SIQUIJOR SEEMED LIKE SUCH AN INTERESTING PLACE, but we were told that due to heavy rains it was very difficult to get to the WATERFALLS and honestly, exploring the island in pouring rain did not strike us as a wise thing to do. 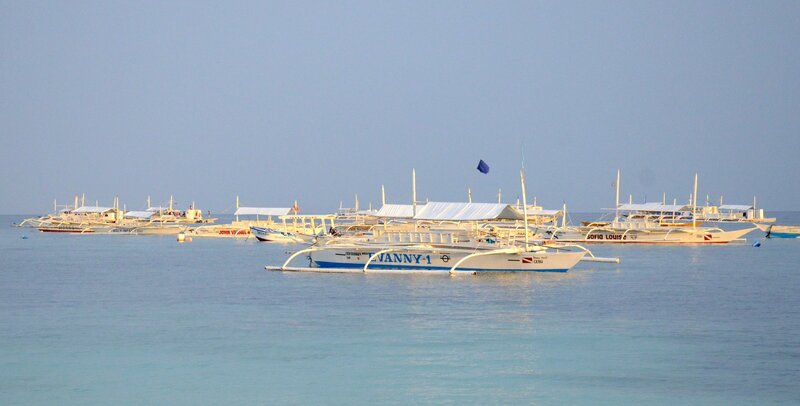 So, we decided to leave the next day with a speed boat to Negros island. 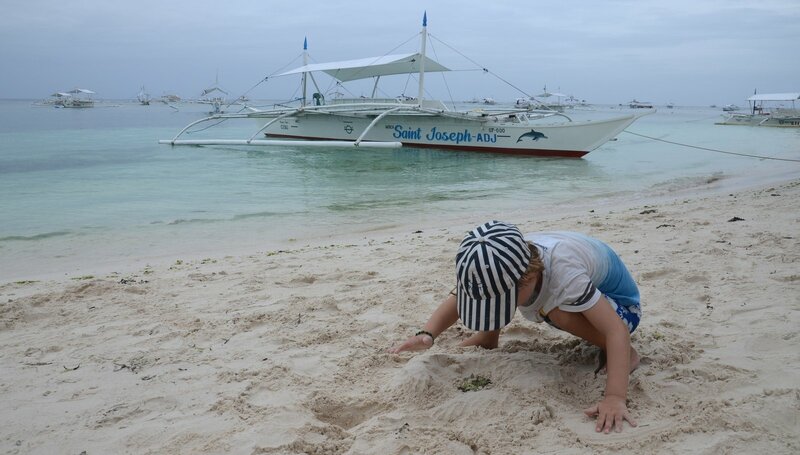 We still wanted to come to APO ISLAND to swim with the turtles, where we had previously booked 3 nights – one of which we already had to cancel. The SPEED BOAT ride the next day was terrible! The waves were so high that the whole boat was shaking so much it was almost impossible to even get on it. Once on it, there were some pretty scared faces of our fellow travellers and we didn´t even take of yet. Luckily Lu just fell asleep and did not wake up until it was over. I on the other hand had serious doubts about what the hell am I doing with a 5-year old on this old piece of a boat which obviously showed signs of lacking maintenance. After about 20minutes one WINDOW BROKE and the water kept coming in, so there were 3 guys fixing it and they did showed signs of panic for a while. The waves were so high you could not see land through the window, it truly was one of my worse boat experiences. Luckily we had LIFE JACKETS on board this time. As soon as we got off in DUMAGUETTE, we were desperate to have a beer and a bite to eat. It was pouring rain and we were wet, tired, slights sick from the bumpy ride and the overall atmosphere was kind of tense. One thing was clear – WE WERE NOT GOING ON ANOTHER BOAT THIS DAY! So, the more we were approaching to Apo island geographically, the lower were the chances we will ever get there. Our plan now was to find a nice hotel (because we deserved it right now) and try to do a day trip over to Apo the next day. And we kind of did. At least we thought so once we saw this amazing pool. It turned out in the evening that we were the only guests besides one couple who as well got stuck along the way due to the weather. The MOSQUITO were happy to see us. 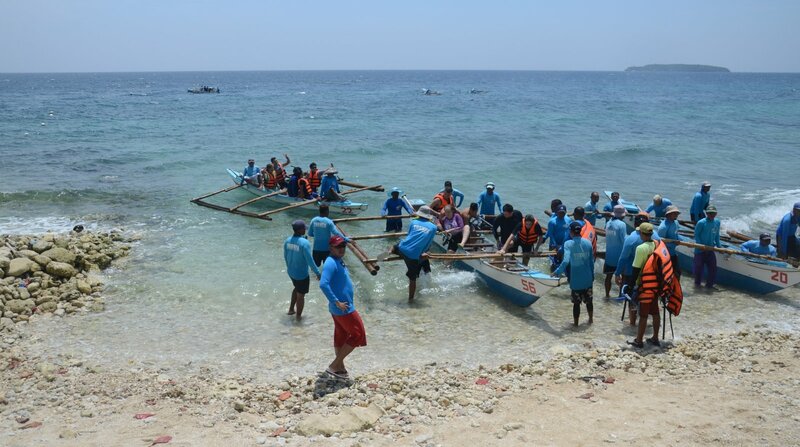 The weather condition was not much better the next day and the day after did look okay again but we had to be in OSLOB, Cebu island in the evning the latest so we really HAD TO GIVE APO ISLAND A PASS. We were looking over at it and it seemed to be so close and yet so far away. That was kind of depressing, because we´ve done all this way ha-ha. 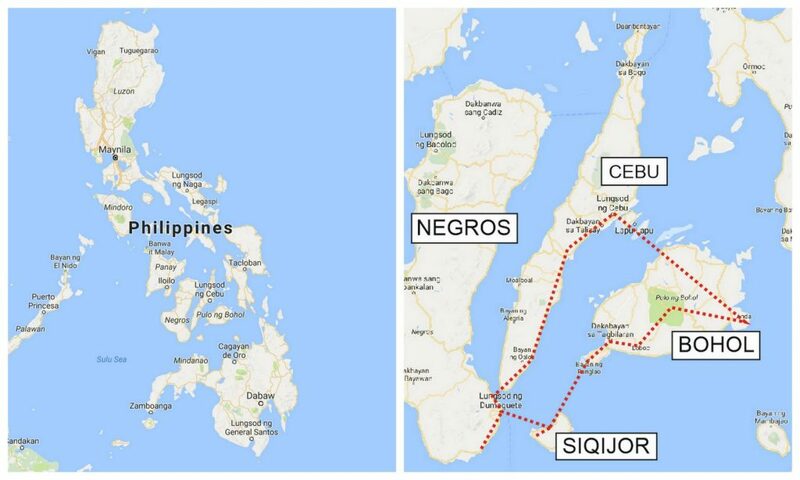 We should have just narrow it down to Bohol and Cebu, but at least we tried. 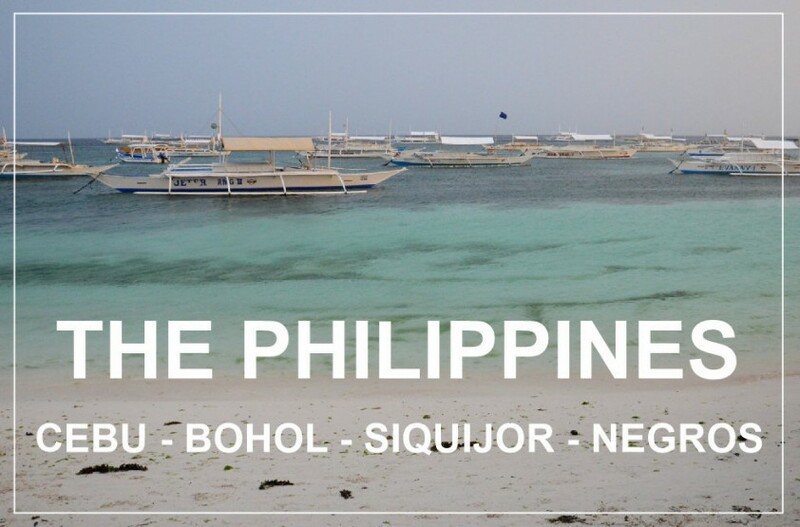 Transport from SIBULAN (Negros) to LILO-AN (Cebu) is pretty uncomplicated, just a short ferry ride and once you are there a BUS is already waiting (there might not be enough space on the bus for everyone so be quick!). The bus is going all the way to CEBU CITY but it can stop on the way and drop you off wherever you want. 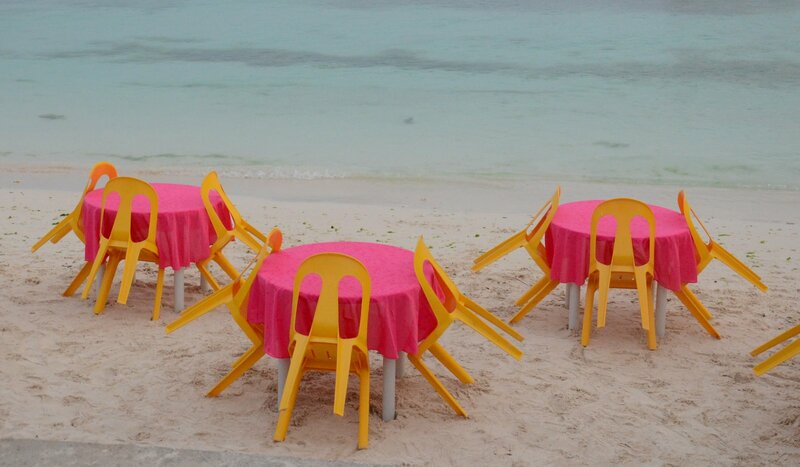 We went off in OSLOB. 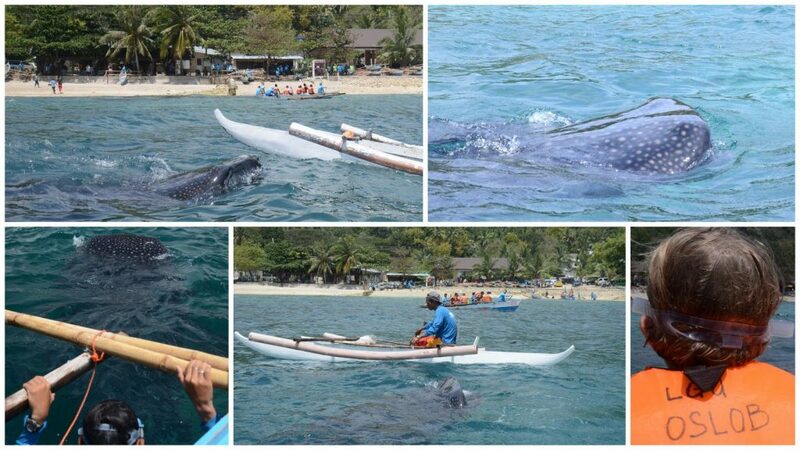 So, the main attraction here is SWIMMING WITH THE WHALESHARKS. You might have heard about it. It sounds like a great exciting thing to do and it somehow also is, but I cannot help but feeling a bit GUILTY I DID IT. Before coming here I read different critiques and opinions, but somehow I thought it will be okay. But it kind of wasn´t really. I did a quick swim and Lu as well, but then I was more interested in how the whole thing functions. See when you enter the area and pay the fees, you are told WHAT TO DO AND WHAT NOT TO DO (don´t wear sunscreen, keep the 4m distance to the animals…). Well, the reality is, it really doesn´t work that way. The whales are BEING FED while you swim with them so that they stay in the area, they had CUTS AT THEIR TALES because they kept bumping into boats and it is just impossible to keep the 4m distance. No one checks if you put the sun blocker on, they just tell you to rinse it off. There might be POSITIVE SIDES to this whole thing as wel – I will be writing a separate post on this topic, but please if you plan to come here – do your research before you go and decide for yourselves if its the right thing to do or not. There are other places in the world where you can SWIM WITH THEM IN THE WILD, without someone feeding them for the purpose of tourism. From Oslob we took the BUS TO CEBU CITY where we stayed one more night before our early morning flight back to HONG KONG. 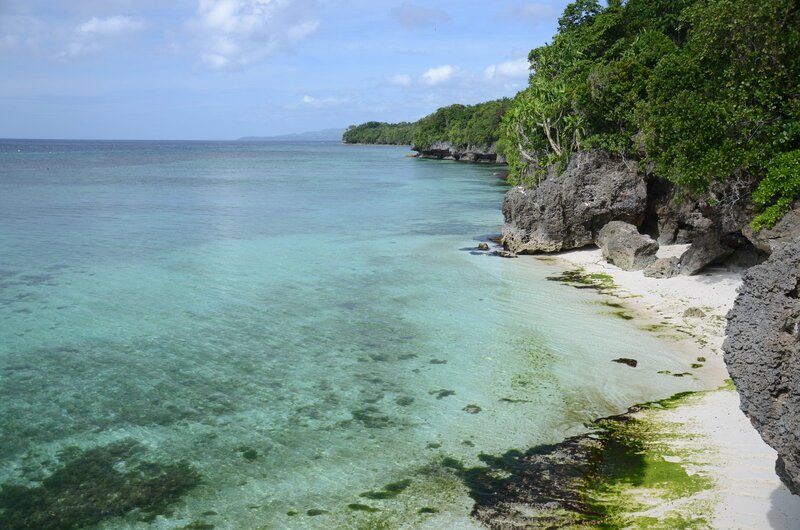 I would really like to come BACK TO THE PHILIPPINES ONE DAY because there seems to be much more to see, we loved the FRIENDLY LOCALS (speaking good English by the way) and the less known / developed places like Siquijor island. All in all it was a POSITIVE EXPERIENCE for our first trip without Lu´s dad and even though things did not go exactly as planned we managed to get the best out of it! Till next time Philippines. 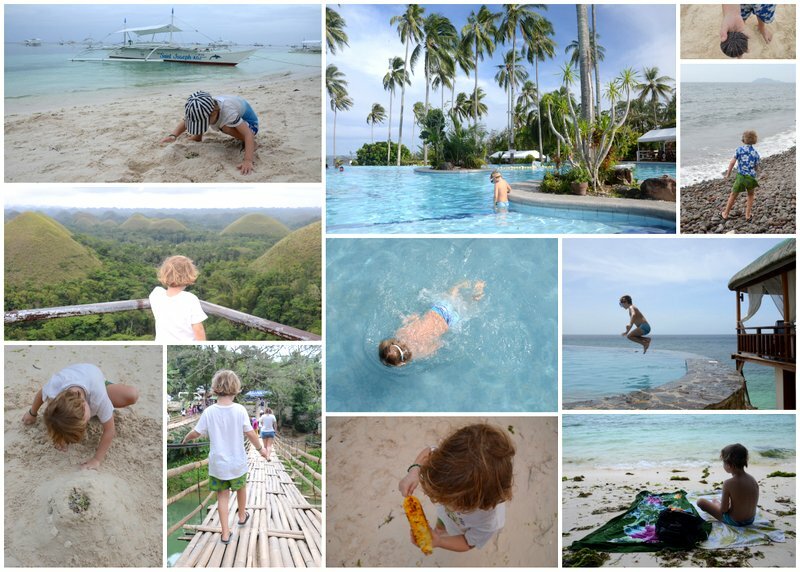 THE PHILIPPINES WITH KIDS yes or no? Definitely YES. 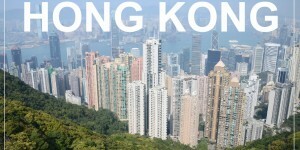 The locals are pretty good in speaking ENGLISH, so there will be less trouble to communicate, besides, they LOVE CHILDREN. 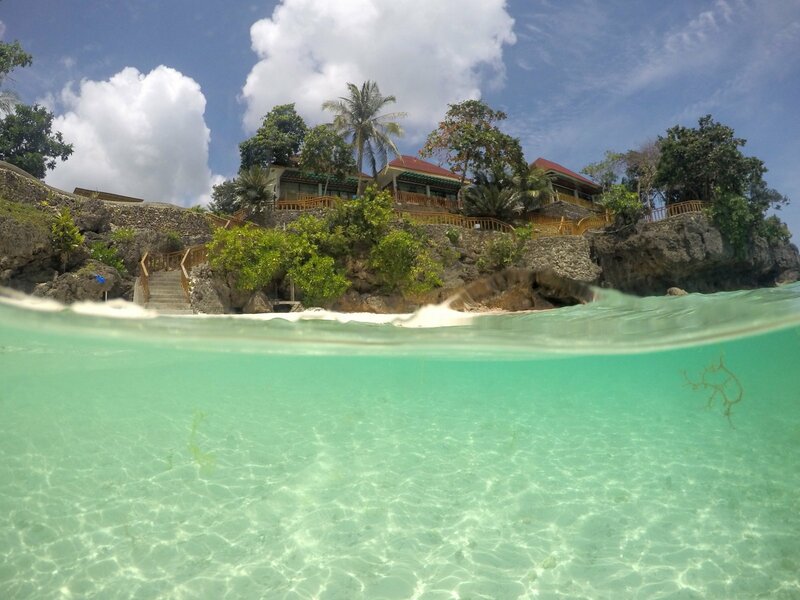 The BEACHES are nice and for a relatively reasonable price you can get good HOTELS WITH POOLS. 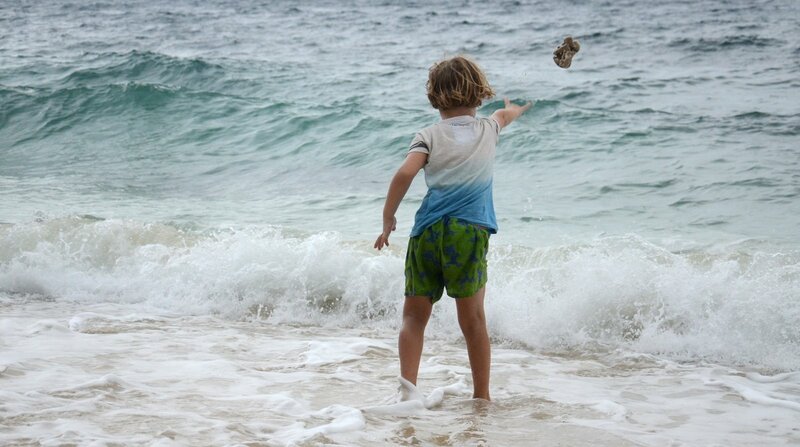 Kids can SNORKEL, SWIM or take EASY HIKES. We found the FOOD to be very tasty actually, we always found something good to eat. There are lots of STANDS SELLING SNACKS along the roads. We also met quite a lot of TRAVELLING FAMILIES with little kids, so Lu had company to play with. Take care of the burning SUN, bring some MOSQUITO repelent, dont drink tap water and maybe pack REEF SHOES for the beach. We had our Hep A and B shots years ago already, but other than that we did not take any other precautions. Even though we were travelling without a grown up male, we never felt unsafe or uncomfortable. 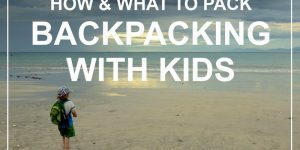 BACKPACKING with kids – how to pack?